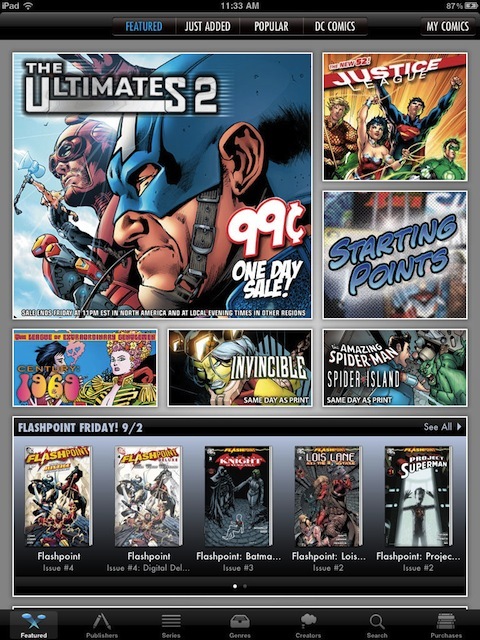 Comics is a free comic book app by comiXology for the iPad, iPhone, and iPod touch. It boasts as being the only comic app with Marvel, DC, and The Walking Dead in its large database of over 12,000 comics to choose from. Included is a list of over 500 comics which can be downloaded for free. The layout of Comics is user friendly and easy to navigate. Users can search the store or browse by various categories. As with many apps, Comics is best suited to be viewed with the ample screen space the iPad has to offer. This should come as no surprise, as an iPad is practically the size of a page out of your average comic. Comics works perfectly fine on the iPhone and iPod, just be prepared to do a lot of zooming in and out to be able to read the text. In an age where Hollywood is seemingly attempting to create a movie remake of almost every comic ever written Comics offers “101” crash courses on some of the most popular superheroes. These 101 comics pack a plethora of information about the superheroes; their spinoffs, their history, charts of their allies/enemies, and some of the more notable points in their history. By browsing through the Superman 101 comic I was able to get quick facts on everything from the basic story to the death of Superman, a pie chart of his numerous allies and enemies, Cyborg and Bizarro Superman, as well as a number of other spinoffs, stories, and enemies in the very extensive Superman universe. These 101 courses are a free way to give users a basic introduction to what has become a rich history of stories that movie makers and other story tellers continue to draw influence from. The newest version of Comics has fixed some stability issues and made navigation more organized for users. Previously it would crash on an all-too-regular basis, but the newest edition has improved on this shortcoming a great deal. The list of purchased comics has also been made easier to select and browse through. Many of the comics cost several dollars which seems like it could add up quick. 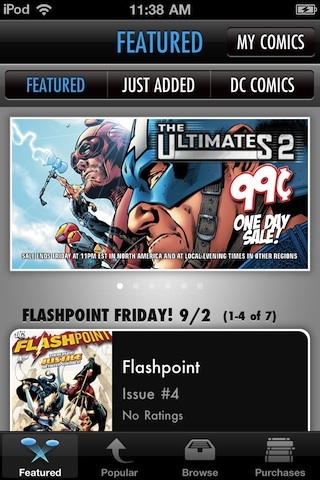 Regardless Comics is a good app for everyone from the serious comic enthusiast to the newcomer looking for a good read. AppSafari review of Comics by Comixology was written by Neema Akhtar on September 13th, 2011 and categorized under App Store, Fun, iPad apps, Reading, Universal. Page viewed 7343 times, 5 so far today. Need help on using these apps? Please read the Help Page. Check out their new native application!